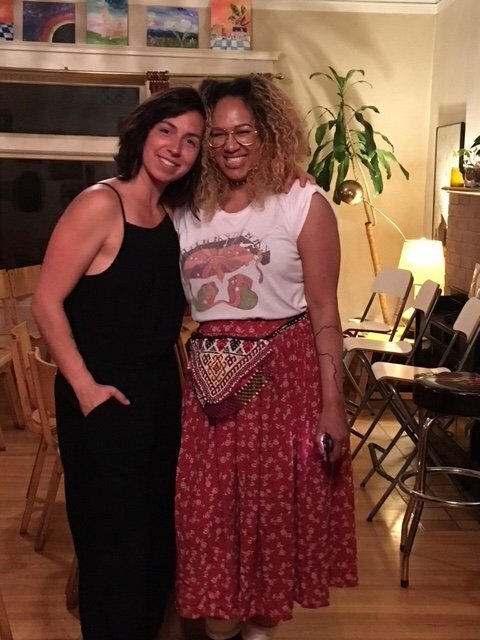 “While I was pregnant I had the honor of meeting and getting to know Becca Recker, one of my favorite women in Cannabis! She is part of an elite team as known as FrogSong Farm, and they are making quite the noise with their incredible CBD products and ethical farming practices. I’ve spoken in recent blog posts about my use of CBD throughout my pregnancy and now that I am one month postpartum, I am integrating FrogSong’s Drops and Salves into my post workout recovery regimen. Every morning I take the oil with my breakfast shake and after workouts I add a few drops into my protein shake! I love the way I feel and notice a huge difference on days I do not have my CBD. It has been such a lifesaver and I am so grateful for people like Becca and her team that make such quality products for people like me to enjoy. I sat down with Becca to get a deeper look into FrogSong Farm and the world of hemp farming. You can follow her and also find out why everyone is getting on board with FrogSong Farm on their newly launched website! BB: Can you tell us a little about FrogSong Farm and why you chose to get involved with the company? Becca: We’re a ten acre sustainable hemp farm in Oregon’s Willamette Valley. We grow Oregon-bred strains of industrial hemp (also known as cannabis), which are rich in cannabidiol, or CBD for short, and have negligible levels of THC. Then we turn the hemp flowers into CBD extract, which is the active ingredient in our wellness products. I’m close friends with the family who dreamed up Frogsong Farm, so I had the privilege of watching the farm evolve from its infancy. I’d been rooting them on from the beginning, because I love CBD. (I’d grown my own high-CBD Harlequin Tsunami plants in years past, and made body butter with the flowers.) I saw their passion for ethical land stewardship and sound business practice. When Reid (the farm’s grower/extractor extraordinaire) approached me with an opening for a sales role, it was a no-brainer. We toured the farm property. He had me at, “Ultimately our goal is to be a zero-waste company…” I was all in. The rest is history. BB: For those who don’t know much about CBD, can you tell us briefly what it is and how it differs from THC? Becca: Most Cannabis (marijuana, hemp.. it’s all the same plant) is rich in THC, the compound that produces a high. THC I being studied for its own profound health benefits, but because it’s psychoactive, it doesn’t fit into everyone’s lifestyle. Cannabis has a whole spectrum of other cannabinoids, which interact with a system in our bodies called the endocannabinoid system. Modern science is most excited about a cannabinoid called CBD. It’s been studied for treatment of epilepsy, cancer, MS, diabetes, opiate addiction, autism, anxiety, depression, immune issues, and more. We have endocannabinoid receptors throughout the body, from the skin, the brain, and deep down into the organs. The science behind how CBD works within our bodies is fascinating! CBD works as a balancer, promoting wellness on systemic and cellular levels. I think of it as a reset button, nudging the body toward optimal function. BB: Why is providing quality CBD to others important to you? What impact has CBD had on your health? Becca: One unfortunate result of the CBD buzz, is that there are tons of companies wanting to cash in on people’s need for this incredible plant medicine. There are a lot of cheap knock offs and low-grade, chemically contaminated CBD products on the market. This is scary. When people seek natural alternatives to help their loved ones manage pain and illness, they should feel safe doing so. But it’s a poorly regulated industry. 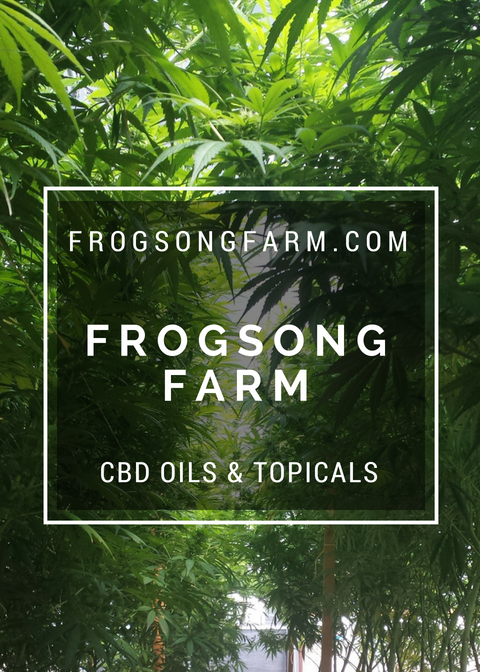 I want Frogsong Farm to be a trusted source for CBD that is earth-friendly and body-friendly, that is grown with love and intention from the start, because that carries into the healing power of a product. Personally, I never really recognized the level of anxiety I’d been living with, since childhood. Once I started taking our CBD tincture, my mind stopped racing, worrying, and overanalyzing. My sleep has improved. My response to stressful situations is mellower. My athletic performance and recovery is fine-tuned. I feel like I’ve discovered the way I am meant to feel in my mind and body. BB: What ailment do you hear most of your clients using CBD for? What results have they experienced? Becca: It’s all over the map. One really common one is arthritis. People will order the salve and have us mail it their parents in other states. People have been using our Rubbit salve for things like chronic back pain, sciatica, MS, overuse injuries, and fibromyalgia. Countless folks use the Drops tincture for mental health benefits like managing anxiety and depression. Lots of families share the Drops with their dogs and cats with great results. Time and again, we get emails or texts simply saying: “I LOVE this stuff! I can’t believe it works! !” So people are experiencing an improved quality of life, living with less pain, generally feeling more freedom to do the things they love. BB: What makes FrogSong so different from other CBD brands? Becca: We’re proud of our sustainable farming practices- we go beyond organic and make decisions that will truly benefit the soil life, the plants, the water and air quality, and local wildlife. We never spray pesticides or herbicides on the farm, period. We’re also vertically integrated, which means we control the entire production process, starting with the seeds. We personally plant, tend, grow, harvest, extract, distill, produce, and sell. It all happens right here. Our CBD doesn’t leave the farm until third party lab testing. There is no middle man. This gives us ultimate control over how the plants and soil are handled, and how our products are produced. This is extremely rare in the hemp/cannabis industry. We price our products competitively, rather than jacking up prices just because we can. We are pursuing our organic certification. We’re also a pending B-Corp, which is a company focused on doing environmental and social good. We donate our products to Portland non-profits serving women minorities and people living with HIV/AIDS. BB: Where are FrogSong products sold? Becca: Online and in stores! We ship legally, and for free, to all fifty states. We invite folks to visit our web store and consider sending FSF products to loved ones as well. They make wonderful gifts. We also supply gyms, yoga and wellness centers, grocery co-ops, physical therapists and massage practices. I manage our wholesale accounts. Know a business who you think should carry sustainable CBD products? I want to know about it. We also have booths at the PSU and Beaverton Farmers Markets here in Oregon. Becca: Click Here for a helpful post I put together for folks who are new to using CBD. The highlights: 1) Some people are nervous to try CBD. Don’t be. It isn’t altering. You will still feel totally like yourself. Maybe even a clearer, more optimally functioning version of yourself. 2) Find a trusted source. 3) Know your dosage. Some products are very confusing in their labeling. Figure out how man mg’s of CBD you’re getting per serving. 4) Start low, go slow. Some people need a few days, to a few weeks, to “wake up” their endocannabinoid system, for full benefits. It’s best to start lower dose and increase as necessary. There is no overdose level, but it’s more economical to take only the amount you need. 5) Consider it a daily supplement. There are so many benefits, that even when I don’t have pain, I make sure to take my CBD for its neuroprotective, antioxidant, anti-inflammatory benefits. 6) Start with 10 mg’s as a dose. Some people use 20-50 mg’s CBD a day. That’s an effective range for most people. Orally, first thing in the morning, is a good option for pain and mood, or evenings about an hour before bed. Topical salves can be used throughout the day, as needed for localized pain, soreness, and inflammation. Right after a hot shower is especially nice. We are very grateful that hemp chose us! This entry was posted in Education, Events, Interviews, People, Products and tagged ABC's of CBD, athlete cbd, Best way to take CBD, cannabidiol, cbd, CBD 101, cbd benefits, CBD for Beginners, cbd health benefits, CBD oil, Does CBD Work, family hemp farm, hemp oil, hemp oil for health, legal hemp oil, where to find cbd oil, workout recovery.